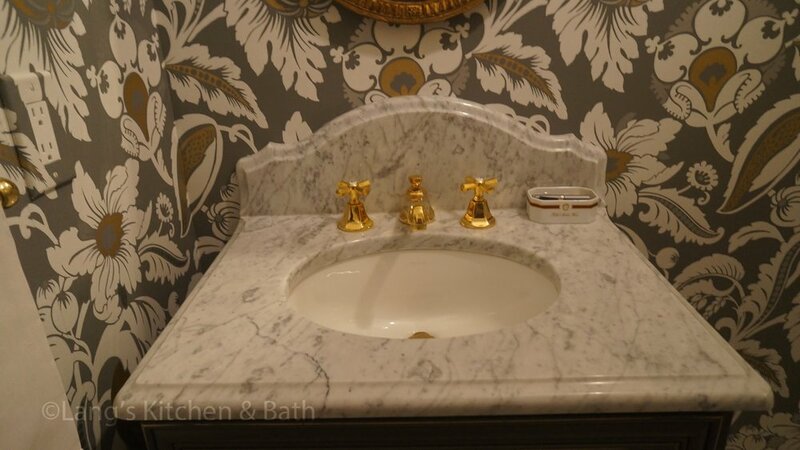 Glamorous powder room design featuring Carrara countertop, marble floor, a distressed finish vanity, and brass hardware. This traditional powder room design brings a touch of glamor to the home. The distressed finish vanity cabinet is topped with aCarrara countertop, and accented with polished brass hardware and faucets. This is complemented by the wallpaper color scheme and the classic marble tile floor design. These elements come together to create a one-of-a-kind space for guests to freshen up.